Prof. Dr. Werner Kloas is the Head of the Ecophysiology and Aquaculture Department at the Leibniz-Institute of Freshwater Ecology and Inland Fisheries, an independent and interdisciplinary research centre dedicated to the creation, dissemination, and application of knowledge about freshwater ecosystems. His main research interests are endocrinology, ecotoxicology and sustainable aquaculture. Since 2010, he is distinguished professor for Endocrinology and Head of the Full professor for Endocrinology at Humboldt University. He has extensive experience in the management of research programmes such as ILES and ASTAF-PRO that won the German Sustainability Price in 2012. Day to day project management is carried out by a Project Management Team consisting of the Project Coordinator, an internal Vice Coordinator (Dr. Daniela Baganz) and a project manager. They are supported by the experienced administrative staff of the Forschungsverbund Berlin e.V (FVB). The FVB represents eight research institutes of natural sciences, life sciences and environmental sciences in Berlin, which pursue common interests within the framework of a single legal entity while maintaining their scientific autonomy. As research institutions of supra-regional importance and national interest regarding science policy, the institutes are financed within the bounds of the joint research funding by the federal and state governments in accordance with article 91 b of the Basic Law. The institutes share an administrative infrastructure (‘joint administration”) and are members of the Leibniz Association. To the supporting staff of the FVB belong Ms. Andrä and Ms. Kowalski (in charge for administrative and financial issues of EU-projects), Mr. Buxhoeveden (manager of the Department for Acquisition, Construction and Building Management), Ms. Wiemer (public affairs), Dr. Kopf (legal advisor), Ms. Weigel (patent office). The management team will support all administrative and organisational tasks (project reporting, internal and external communication, consortium agreement). The Scientific Coordinator monitors and supervises the overall work progress in research and development as well as demonstration activities. The consortium has nominated a Work Package Leader for each work package. They are responsible for monitoring progress, verifying milestones and controlling deliverables in order to guarantee a smooth process and schedule the work progress in their own WP. They report to the project coordinator concerning progress, bottlenecks and minor adjustments. The WP leaders assure also that interdependent deliveries are made in time. WP Leaders have extended experience with managerial and scientific issues in complex (European) projects (see the qualifications below). They are responsible for the scientific contents and progress and report to the project coordinator. 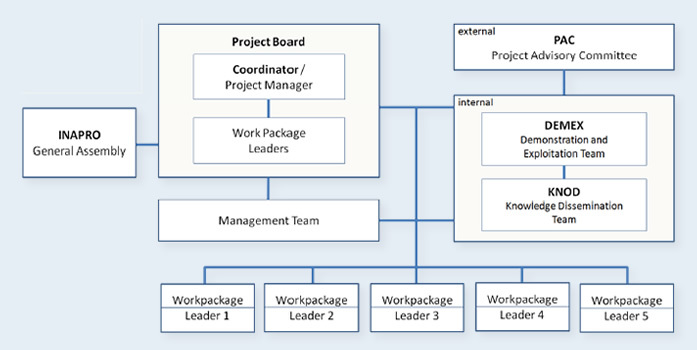 The Project Board is installed as a governing and decision making body consisting of the INAPRO Project Coordinator and the Work Packages Leaders. It monitors progress in WPs, gives ad hoc direction and makes decisions about starting up and closing down project activities within the indicated time path and resource constraints and decides on the contents of the annual progress reports for the Commission. The Board is responsible for the project strategy. It discusses and approves the roles and responsibilities of the project partners. To facilitate the decision making process, Rules of Procedure for the Project Board as described below will be drafted and put to the Board for approval and adoption. The Project Board will be chaired by the INAPRO Coordinator or alternatively by a Work package Leader if appropriate. Two project teams will support the Project Board in the especially project relevant fields of Demonstration and Exploitation (DEMEX) and Knowledge Dissemination (KNOD). The responsibility of Demonstration and Exploitation Team (DEMEX) is to advise the Board on demonstration and exploitation activities to the market. The leader of DEMEX is Dr. Sven Würtz from IGB). DEMEX enhances the close cooperation between the Project Board, project partners who are end- users and manufactures as well as further external end- users and manufactures and promote a strong market orientation. The activities carried out by DEMEX are described in WP4 and WP5. DEMEX meets twice a year. The Knowledge Dissemination Team (KNOD) is concerned with strategic knowledge management, knowledge transfer to different stakeholders, including the securing of Intellectual Property Rights (IPR) and patent related issues. It will advise the Project Board on results dissemination activities. The leader of KNOD is Prof. Rauschenbach from AST. The team meets twice a year. The General Assembly functions as the ultimate decision making body in INAPRO and meets once a year, before the annual reporting period. As such it shall consider the reports of the Project Board, receive and approve the accounts for the past (financial) year and approve the budget and the new implementation plans for the next project period. To inform the whole consortium about the overall project progress all partners will contribute to the general assembly with short presentations on their specific results obtained during the reporting period.